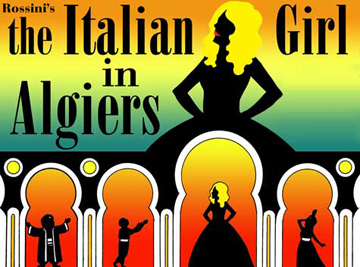 Boston Midsummer Opera Presents "The Italian Girl in Algiers"
"The Italian Girl in Algiers"
Boston audiences will experience Rossini’s rarely performed-live "The Italian Girl in Algiers" as Boston Midsummer Opera (BMO) presents the comic masterpiece as its 2011 production. Playing at the Tsai Performance Center at Boston University for three performances only, July 27, 29 and 31, the production will be sung in English and performed with orchestra. Music director and nationally acclaimed conductor Susan Davenny Wyner will lead the fully staged and costumed production, with Sandra Piques Eddy in the role of Isabella. Directed by Drew Minter, "The Italian Girl in Algiers" (L'Italiana in Algeri) combines Rossini’s fast-paced comic energy with elegant melodies. Composed in less than 3 weeks when Rossini was 21, "The Italian Girl in Algiers" is a tale of manipulation and love. The Turkish Bey, Mustafa, is bored with his wife, Elvira, and his submissive harem. Desiring a new challenge to his virility, Mustafa decides that, in Elvira's place, he wants an Italian woman. The Italian woman chosen is the shipwrecked Isabella, who has other plans in mind, especially when she discovers that her lost love, Lindoro, has been enslaved by Mustafa. Armed with only her feminine wiles, Isabella must outwit Mustafa for her future and her love. Mezzo-soprano Sandra Piques Eddy was last seen with BMO in their 2010 production, "Trouble and Chocolate," as Dinah in Leonard Bernstein’s "Trouble in Tahiti." Her recent credits include: the title role in "Carmen" for both Opera North (UK) and Lyric Opera of Kansas City; Isabella in "L'italiana in Algeri" with Austin Lyric Opera; Zerlina in "Don Giovanni" with Opera Omaha; Hänsel in Portland Opera's production of "Hänsel und Gretel;" Mercedes in the Metropolitan Opera’s new production of "Carmen" (also broadcast nationally on PBS and theatrically live in HD); and as Idamante in the Boston Lyric Opera production of "Idomeneo." Soprano Sara Jakubiak makes her BMO debut as Elvira. Her recent credits include: Cathy in "Wurthering Heights" with the Minnesota Opera; Dede in "A Quiet Place and "Lucky to Be Me: The Music of Leonard Bernstein" with the New York City Opera; a soloist in Beethoven's Symphony No. 9 with the Indianapolis Symphony Orchestra; a recital with baritone Ross Benoliel for Music at Bunker Hill; Beatrice in "Three Decembers" with Chicago Opera Theater; and Donna Elvira in "Don Giovanni" with the Boston Youth Symphony Orchestra. Also marking his BMO debut, Tenor Bradly Williams (Lindoro) is one of opera’s most sought after tenors in the bel canto repertoire, and has performed extensively in Europe and North America. Recent credits include: Arturo in "I Puritani" at the Seattle Opera; Ramiro in "La Cenerentola" and Giannetto in "La Gazza Ladra," both with the Gran Teatre del Liceu in Barcelona; Belmonte in "Die Entführung aus dem Serail " with Austin Lyric Opera; Ernesto in "Don Pasquale" with Connecticut Grand Opera and Orchestra. Bass-baritone Eric Downs (Mustafa) was last seen with BMO as Don Alfonso in its 2009 production of "Così Fan Tutte." Recently, he has also appeared in: Handel's "Messiah" with the Washington National Cathedral as a soloist; Haydn's "Paukenmesse" at Carnegie Hall through MidAmerica Productions; Victor Herbert 150th Birthday Celebration gala with Little Orchestra Society of New York as a soloist; and the Boston Youth Symphony Orchestra as Leporello in "Don Giovanni". Baritone David Kravitz (Taddeo) was last seen with BMO in its 2006 production, "The Marriages of Mozart." He recently made his New York City Opera debut in Strauss's "Intermezzo," and his European debut at Monte Carlo's Salle Garnier in the world premiere of Tod Machover's "Death and the Powers" which subsequently traveled to Chicago Opera Theater and the American Repertory Theater. He also returned to Opera Boston for Hindemith's rarely-heard opera "Cardillac," and sang Nick Shadow in Emmanuel Music's production of "The Rake's Progress." Director Drew Minter has sung leading roles on international stages for three decades. In 1993 he was asked to direct Handel's "Radamisto" for the Goettingen Handel Festival, an engagement which led to his being the director of opera there for five seasons. Since then he has directed shows for the Caramoor Festival, Lake George Opera, Opéra de Marseilles, The Folger Shakespeare Theatre and Boston Early Music Festival, among many others. Susan Davenny Wyner has been nationally acclaimed for her conducting. The Library of Congress featured her in its 2003 "Women Who Dare" Engagement Calendar, and the "MacNeil-Lehrer Newshour" and WGBH Television have presented special documentary features on her life and work. Her conducting credits include the Los Angeles Philharmonic, The Czech Philharmonic Chamber Orchestra, Boston Lyric Opera, the Danish Odense Symphony, and Cleveland Orchestra members in special benefit concerts. She has also conducted concerts at the Hollywood Bowl, in Italy and the Czech Republic, and has been Music Director and Conductor of The Warren Philharmonic Orchestra near Cleveland, Ohio since 1999, and of Opera Western Reserve since its founding in 2004. The Tsai Performance Center is located at Boston University, 685 Commonwealth Avenue in Boston. For tickets and information, call 617-227-0442 or visit www.bostonmidsummeropera.org.